Eran las 8.25 de este sábado cuando un convoy de siete barcazas de bandera paraguaya que transportaba toneladas de minerales colisionó contra la defensa que protege el pilar Nº 5 del puente Chaco-Corrientes. Dos barcazas se hundieron, otras quedaron libres navegando al garate y otras tres pudieron ser controladas. Las autoridades de Vialidad Nacional aseguraron a NORTE de Corrientes que pese al impacto el puente no sufrió daño. Sí la defensa que fue desplazada de su lugar original por lo que al mediodía de hoy llegarán funcionarios de Buenos Aires de esa entidad para evaluar los trabajos que deben realizarse para reinstalar la defensa donde corresponde. “El pontón se desplazó unos 50 metros de donde estaba, por lo que hay que volverlo a su lugar. Lo que hay que dejar en claro es que con la colisión las barcazas en ningún momento tocaron el puente sino solamente la defensa”, dijo el director de Vialidad Nacional, Carlos Colombo. El container -empujado por un remolcador- se desplazaba con siete barcazas río abajo. El número permitido es de cuatro barcazas, una disposición adoptada por la Prefectura Naval para amenguar los riesgos en el puente, una zona de difícil navegación. Tampoco está permitido navegar en horario nocturno. Una mala maniobra hizo que la formación impactara contra la defensa y con ello, dos de las barcazas se desprendieron y se desplazaron a 450 metros del lugar del hecho. En estos momentos se encuentran a unos tres metros de profundidad y a poco más de 2,90 metros del canal de navegación. Este dato lo suministró el equipo de buzos de Barranqueras que trabajó en el lugar. Ellos señalizaron la ubicación de las mismas no sólo para asegurar a los demás navegantes del canal sino para ratificar que no había necesidad de interrumpir el tránsito en el Paraná. “Otras dos barcazas del container quedaron a la deriva. Tanto las que colisionaron como las que se desprendieron del remolcador, pasaron por debajo del Puente sin que lo tocaran”, explicó el funcionario. Las tres restantes no se desprendieron del container. Según explicó Colombo, tanto el container como las barcazas salvadas fueron trasladadas hasta el puerto de Barranqueras. Hoy, las que permanecen en aguas del Paraná deberán ser retiradas del espacio natural por la empresa responsable del material. Las autoridades nacionales no se arriesgaron a confirmar en cuánto tiempo podrán realizar este trabajo. “Más allá del hecho negativo que sucedió con este nuevo impacto, lo positivo es que las barreras del puente funcionan y están en condiciones pese a todas las críticas que reciben”, dijo Colombo, quien confirmó la presencia de funcionarios nacionales de Vialidad para estudiar los trabajos que se deben llevar adelante. Colombo aseguró que el daño no fue importante. “Es más, en el momento en que se dio el impacto la gente que estaba en la Costanera no se dio cuenta. Lo hicieron cuando advirtieron el hundimiento de las barcazas y el desprendimiento de las restantes”, dijo el funcionario nacional a NORTE de Corrientes. A major dredging project that will deepen a 34km section of the Suez Canal’s western channels by 1.2m to 15.8m is scheduled to get under way this week. "This project will allow giant container ships heading south to pass through these channels and reduce total transit time," the canal authority stated. The long-awaited project has no scheduled end date and could take many months to complete. The canal has its own dredging fleet and a further project, to widen anchorage areas in Great Bitter Lake and at the tips of the western channels, is also planned. 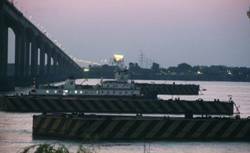 It comes as the Suez Canal posts record traffic movements this year, partially because of delays at the Panama Canal as the latter’s expansion project continues. For the first time, on all-water services from Asia, more ships are moving through the Suez Canal than the Panama Canal. 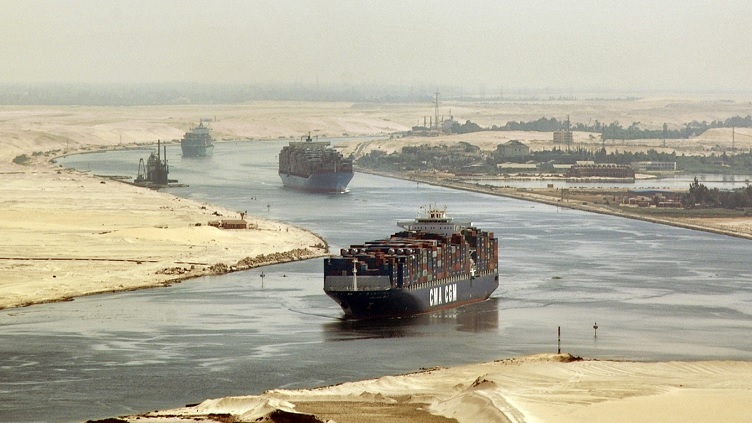 In May this year, the Suez Canal Authority stated that 704 ships passed through the canal, up 6.9% on the previous month. Of them, 256 were container vessels – by far the majority – and as the authority points out, the average size container ship passing through the canal is about 7,750teu, while the current maximum for ships using the Panama Canal is about 5,500teu. The voyage from Murmansk to Japan takes 18.1 days through the Northern Sea Route, compared with 37.1 days through the Suez Canal. A Rotterdam/Far East voyage takes 23 days through the Northern Sea, 10 days less than through the Suez Canal. There will be more LPG exports from the US Gulf, West Africa and Algeria into Asia this year due to growing arbitrage opportunities, a consultancy has predicted. FACTS Global Energy projected that the West-East arbitrage trade will hit 3.7M tonnes this year or around 10% of Asia’s total LPG imports, up from 2.3M tonnes in 2013. FACTS cited growing LPG production in the West of Suez, led by the shale gas revolution in the United States. The West-East LPG arbitrage trade was nearly 1.7M tonnes over the first four months of 2014. In April alone, the loadings bound to the East totalled 585,000 tonnes, nearly 100,000 tonnes more than March. FACTS said: "Buyers in the East of Suez are buying more LPG from North and West Africa and the US, in view of diversifying their sources." US LPG exports would continue to buoy the market until the Panama Canal expansion is ready in 2016, said FACTS. This is because currently, only four VLGCs – Ronald N, Caroline N, Clipper Star and Clipper Sirius – are able to transit the current dimensions of the canal. As a result, the current US Gulf-Far East trip takes at least 41 days, compared to 21 days for the Gulf-Far East route. The Middle East remains the biggest supplier of LPG to Asia. Videotel has launched a training course, “Noise and Vibration – The Forgotten Hazards”, to coincide with new SOLAS requirements coming into effect on July 1st. to ships at sea, marrying its VSAT communications system with packages for a variety of on board applications. It already offers entertainment, in the form of TV, movies and global news, as well as electronic chart services from Jeppesen and weather routing data from AWT. Computer based training and e-Learning services will be the latest addition to this list following the Videotel acquisition. annual combined revenues in 2013 of £14 million, of which approximately 93 percent was derived from multi-year subscription- based services, with a gross profit margin of approximately 73 per cent. will be a key enabler in the delivery of the e-Learning and distance learning services and cloud-based training management systems that Videotel offers,” said Mr Kits van Heyningen. Fittingly, at a time when it is joining forces with a crew communications provider, Videotel has recently added a new training course on the use of social media by seafarers serving on ships. The ‘Social Media at Sea’ programme aims to address the dangers of inappropriate use of social media by shipboard personnel, and aimed at all seafarers who use social media sites on board. website provides three additional resources: a directory of charities and seafarer organisations; a list of training programmes; and a dedicated area for maritime events and conferences. These additions aim to complete thenews and community sections, which have been at the core of Crewtoo since it was launched in August 2012 by Headland Media before it was bought by KVH in May 2013. The regulations set maximum noise limits for machinery spaces, control rooms, workshops, accommodation and other spaces on board ships. The Videotel course uses documentary footage, graphics and reconstructions to encourage seafarers to take precautions against Noise Induced Hearing Loss (NIHL) and vibration-related health risks. NIHL is permanent and cannot be cured. When the degree of hearing loss reaches the point where a hearing aid is required, the seafarer may no longer be able to work on board ship, except perhaps in the galley. Hand-Arm Vibration Syndrome and Whole Body Vibration Syndrome can be extremely painful and cause long-lasting distress. Available as an interactive CD-ROM, Videotel On Demand (VOD) and a DVD with supporting workbook, the course sets out the sound levels that seafarers can safely be exposed to and emphasises the importance of wearing ear protection and of following company procedures for working safely with hand-held vibrating equipment. “Noise and vibration controls are an essential part of good practice in the onshore workplace,” said Nigel Cleave, CEO of Videotel. Imtech Marine today announced that it will start offering a subscription-based service called PressReader next month, which allows ships to download selected newspapers and magazines daily via satellite and offers crew members a local Wi-Fi connection to read them on their personal devices. PressReader will give access to the full content of more than 2,500 newspapers and magazines in 60 languages from more than 100 countries. Each ship can select the titles it wants to download, based for instance on its location or demographics. Once a title is downloaded it can be viewed on a crew member’s PC, laptop or mobile device at any time during the trip. PressReader offers titles likes The Guardian, The Moscow Times, The Washington Post, China Daily and The Philippine Star. “By adding PressReader to our connectivity portfolio we give a very useful tool for ship-owners to improve the crew morale,” said Rob Verkuil, business development manager of Imtech Marine. “The wealth of titles makes it easy for ships to customise a library of publications that caters to the diversity of their crew,” added Igor Smirnoff, chief commercial officer at PressReader. Imtech Marine says that it will demonstrate PressReader at its booth at SMM in Hamburg this September.